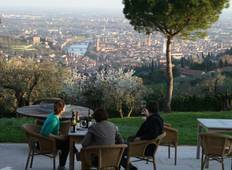 Find the right tour for you through Verona. We've got 210 tours going to Verona, starting from just 3 days in length, and the longest tour is 47 days. The most popular month to go is June, which has the most number of tour departures. "I had never taken a tour before, but had wanted to visit the Italian Lakes (and Dolomites)..."
"The Italian lakes scenery and towns where we stayed are magnificent Our guide Francesca..."
"Me and my friend had an amazing experience on the Let's Go North tour. Every one..."
"The whole tour was very interesting. I want to say a big Thank you to our guide Rodolfo..."
"This tour covers all the major attractions in Italy and even the under acknowledged..."
"I loved this tour. I had two guides, first Sasa in Florence and then Veronica for..."